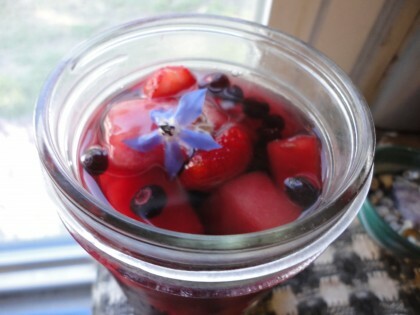 This is a riff on Susan’s Hibiscus Blueberry Cooler, for lazy girls like me who forget to plan ahead. It’s so easy you can even make it if you’ve already laid down on the couch for a nap. I simply got up, chopped a round of watermelon into chunks and set them on wax paper a plate in the freezer while boiling water for the teabags. Then I went back to my nap. I thought I’d be serving this to Alexandra Teague, the talented and accomplished poet who graciously wrote this blurb for my forthcoming chapbook of poetry if a sparrow. She came to visit me at home for the first time to see my garden. We had a lovely, lively visit—turns out we have much in common, despite our age difference—but alas, she was not thirsty when I offered her something to drink. So in the end I enjoyed this treat myself later in the evening while I watched a movie. It truly was ambrosial. And really fun to drink my tea with a spoon. Put the 3 tea bags in the quart jar. Boil water in your tea kettle. Take the water off the boil. Just as the water goes quiet, pour over the tea bags and let steep for an hour. When ready to serve, fill a pint canning jar with frozen fruit. Pour tea over the fruit. 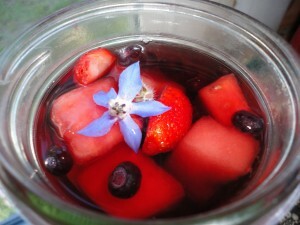 Add a strawberry or two, or top with an edible flower for, well, “flourish.” Enjoy with a spoon, the slow miracle way. Notes: You can do this with any tea and any fruit your heart desires. I think a Good Earth or chai style tea would be marvelous with frozen chunks of peaches or nectarines. Maybe an extra cinnamon stick or slice of ginger root in the tea while it’s steeping. Add a raspberry or two to the frozen fruit. Or a sprig of mint. Use what Summer offers you, where you are. Looks amazing. I can’t wait to try this myself. Never thought of putting frozen fruit in iced tea. This tea look delicious Maria and so pretty. But it’s very cold here in Adelaide so I’m sipping on squeezed lemon juice with half a teaspoon of chilli flakes (chillies still growing in my garden) half a teaspoon of turmeric and some pieces of fresh ginger covered with boiling water and sweetened with stevia. It’s so soothing for my poor old sore throat (first cold I’ve had in years and I’m quite miffed about it). That looks soooo refreshing Maria!! I will have to try a version of it today. Looks perfect for these 90 plus degree days with high humidity that we have been having. Thanks never give up!! I am really enjoying it, and hope your version takes the edge off the heat and humidity back east. It sounds pretty intense. Frozen fruit to the rescue! Hi Ashley–Yes, I bet she is. Some of her most lovely poems in Mortal Geography are about her students. I’ve never had hibiscus tea but I just know this would be the coolest drink at the party. Thanks, Angela! 🙂 Let me know if you give it a try.